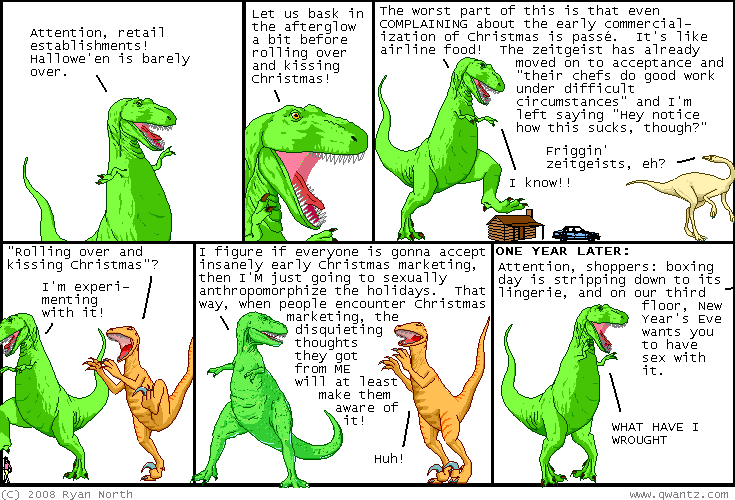 Dinosaur Comics - November 10th, 2008 - awesome fun times! –Darkness cannot drive out darkness: only FRIGHT can do that? Done! November 10th, 2008: Alex pointed me towards this story of two people who found money in the walls of a house, couldn't agree on how to split it, and so both ended up with pretty much nothing. It is the ultimatum game in real life! Assuming you believe that by finding something you deserve to own it, anyway! Also I wanted to link to a short interview I did with juiceboxdotcom.com where on Monday I talk about the worst things and on Friday I talk about the best things.